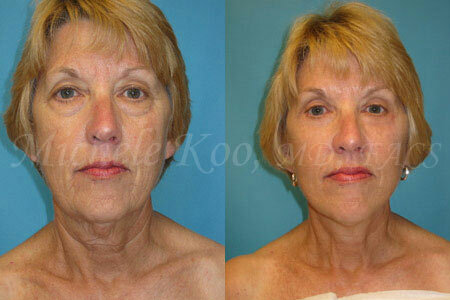 56 year old St Louis area woman hated her baggy lower eyelids. They would turn dark and become fuller and fuller the later in the day it became. She disliked the hollow of the lower lids and the fullness of the fat and skin above the hollows. She didn’t like not being able to wear eye shadow and having her upper eyelid skin smudge her mascara constantly. Dr Michele Koo created a crispy single upper eyelid and removed the fat of the lower eyelids smoothing the skin to remove the hollow and the fat above them. She no longer has a break between her eyelid and her cheek. The patient’s upper and lower eyelid blepharoplasty (eyelid rejuvenation) took one and a half hours and the patient was able to go home and drive in 2 days and return to work in 7. Usually there is swelling that can last one month to 3 months, but after one month, the eyes look very presentable. Notice even her jawline and cheek area seem smoother and the overall face more rested, full and softer.